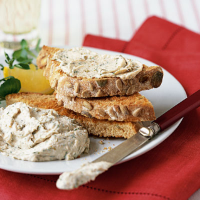 This creamy trout pâtè with capers and fresh dill makes an easy starter or lunchtime snack, served with wholegrain toast and lemon wedges. Place the soft cheese and butter in a food processor and blend until smooth. Flake the fish into the processor, removing any small bones if necessary. Blend again until smooth, scraping down any mixture from the sides of the bowl. Add the capers, dill and some freshly-ground black pepper. Blend very lightly until the capers are roughly chopped in the pâtè. Turn into a serving dish or 4 individual dishes. Cover loosely with clingfilm and chill until ready to eat. Serve with toast, salad leaves and lemon wedges. Make the pâté up to a day before you want to eat it, cover and chill. If you don't have a food processor, beat the soft cheese and butter in a bowl until smooth, then beat in the flaked trout. The pâtè will have a slightly coarser texture. The smoked and tangy flavours here would really go well with an aromatic, crisp but slightly creamy New World Pinot Grigio.